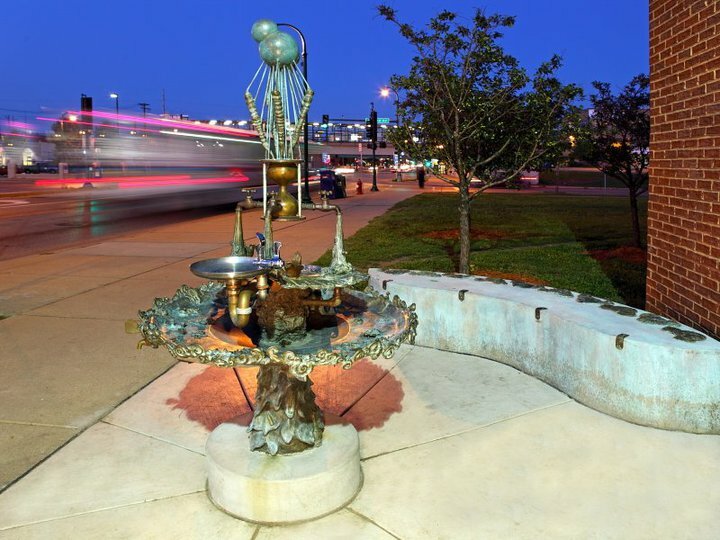 The City of Minneapolis Artist Designed Drinking Fountains celebrate the role water has played in Minneapolis history and seeks to reestablish public drinking fountains as central to the health and wealth of the City. This drinking fountain sculpture and gathering area celebrate and honor water as the foundation of life, its ability to connect all life and its capacities as a natural shaping force. The fountain sculpture is a geophysical time record, a response and containment of information of the effects of water on earth and human interaction and relationships with water. The design includes visual representations on Minnesota’s geology, time, water, process, the Mississippi River and human interaction with these elements and concepts. It is intended to encourage exploration of and generate civic dialogue regarding our drinking water: clean water, conservation, ownership, watershed, other sustainability issues, etc. We chose a classical fountain design as a symbol of water and a traditional and inclusive community gathering place. Ornate decoration, rock formations and cast metal inclusions echo the Midwest grotto style. Grottos are rooted in regional context in concept and materials and offer a sacred and communal space. The water molecule at the top of the fountain begins the process and passage of water and time. Vapor, rain and icicles come down and pass through the hourglass with three spigots for these three forms of water. Fossils and rock formations-including the erosion and cutting the river valley (top/small basin), overflowing a lake and glacial depression which forms the Mississippi River (bottom/large basin). Student-artists from South High School in Minneapolis participated in a cast metal sculpture residency to create the bronze molecules that are on the bench. The students sculpted their imagery and words related to our discussions into the water molecule design relief sculptures. Their artwork is inspired by studying fossils of the pre-historic ocean and identifying the many languages of the neighborhood – celebrating and preserving the diversity of life. Artwork from South High School students – Marcus Aponte, Macy Cockbearn, Zak Doyle, Patrick Grafing, Aubrey Miller,Amanda Mills, Austin Peterson, Sam Philpot, Andrew Reina, Stevie Yanez, and Eli Zabloski. Mary Altman/City of Minneapolis Public Arts Administrator, Casting Creations Foundry, Max Cast Foundry, Max Cora/Cora Metal, Alan Knaeble/UMN Geological Survey, Mayor R.T. Rybak, Sandy Speiler, founder of In The Heart of the Beast Theater, Denny Sponsler, art teacher at South High School, YWCA-Midtown, and contributing student-artists at South High School.